This is the sixth post in a series featuring North Carolinians discussing their love of Israel. Thank you Natalie Ecanow! On my eighth-grade trip to Israel, my class davened the Kabbalat Shabbat service at the Kotel during our time in Jerusalem. Welcoming Shabbat through raucous song and dance with seventy of my peers against the backdrop of the setting Jerusalem sun is something that I will never forget. The best food I had in Israel would, hands down, be frozen yogurt in Tel Aviv. Piled high with fresh fruit and Israeli delicacies, I once drove from Jerusalem to Tel Aviv just for froyo. Nachalat Binyamin Market in Tel Aviv. I could spend hours strolling up and down the street browsing the work of Israeli artists and craftsmen. The Dead Sea. Floating in the Dead Sea is an experience like no other! Tel Aviv. The vibrancy and innovative energy of cosmopolitan Tel Aviv is a testament to the strength and influence of the modern State of Israel. 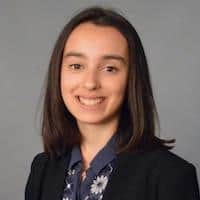 Natalie Ecanow is from Chicago and is a sophomore at Duke intending to major in political science and minor in Middle Eastern studies. She attended Jewish day school and high school and became actively involved with AIPAC during high school. On campus, she continues to be involved with pro-Israel activity through DIPAC—Duke’s student AIPAC group.